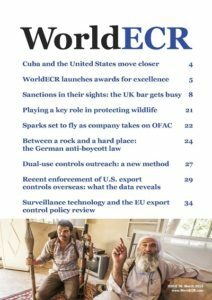 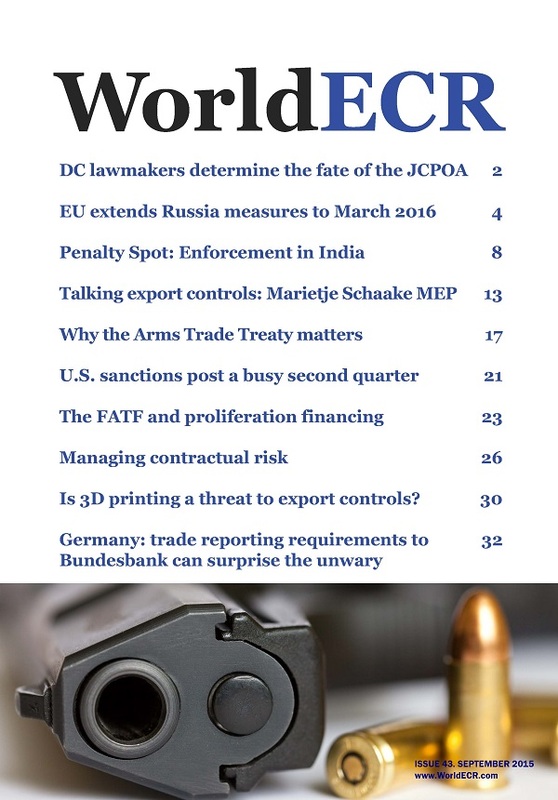 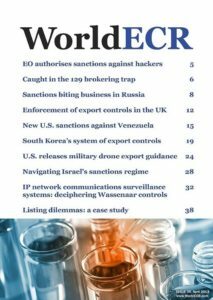 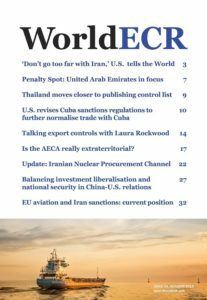 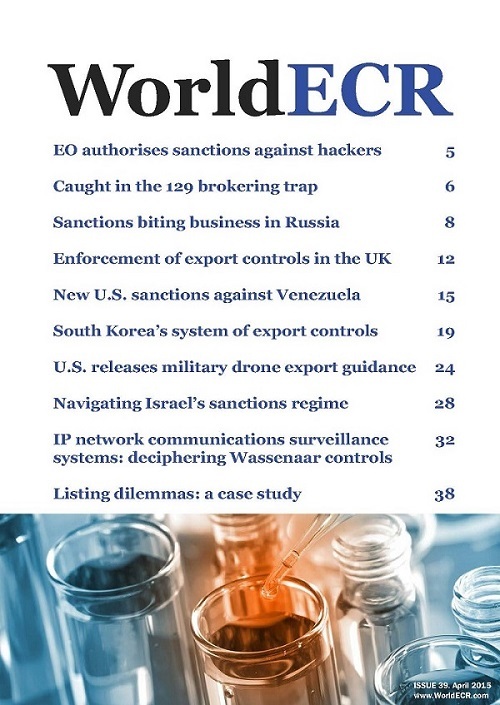 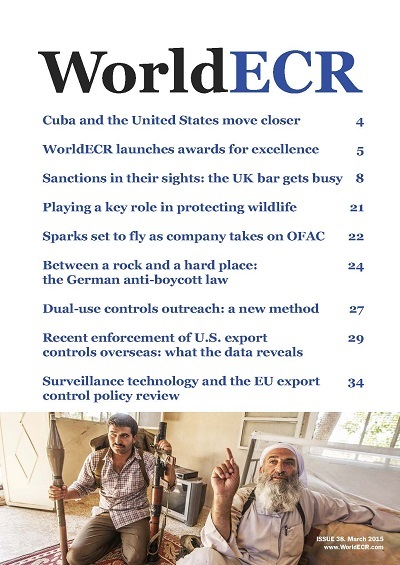 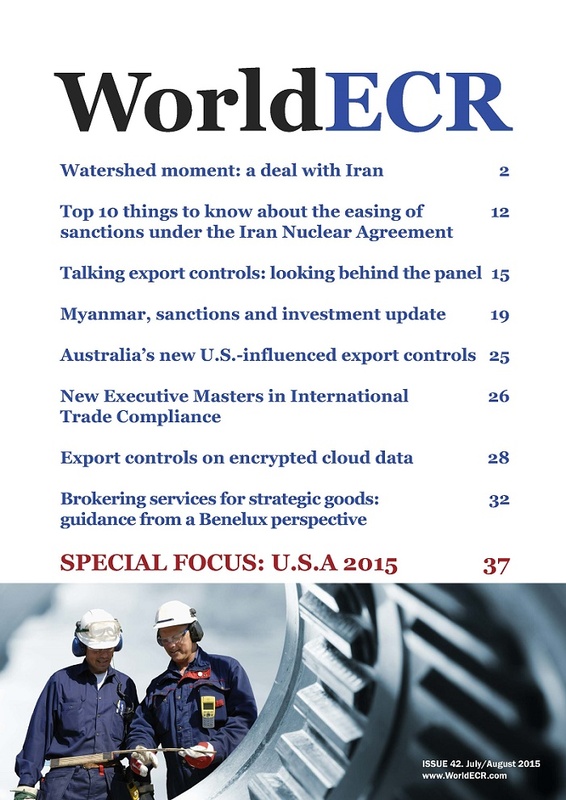 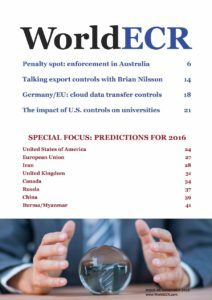 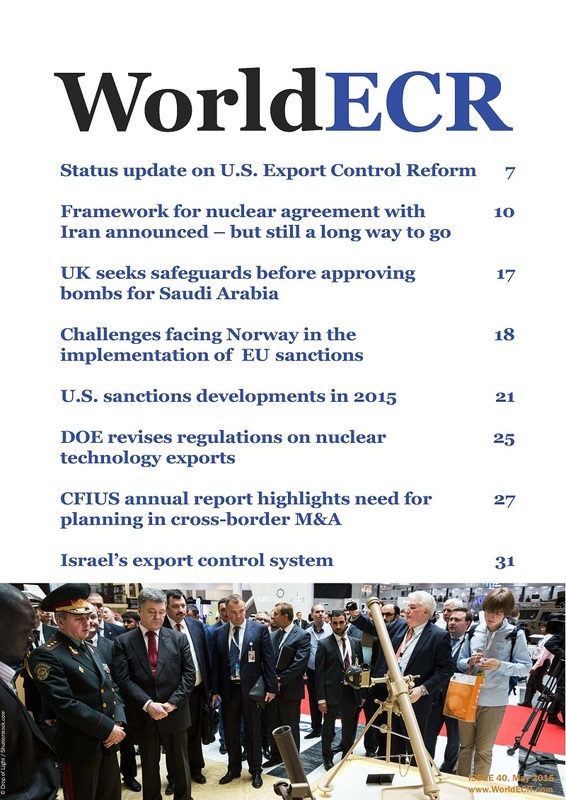 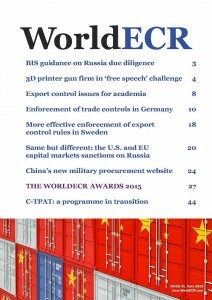 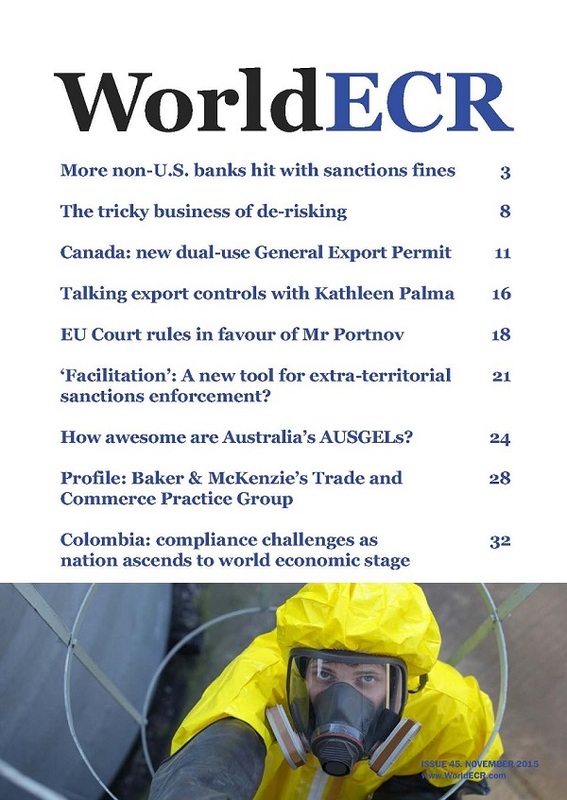 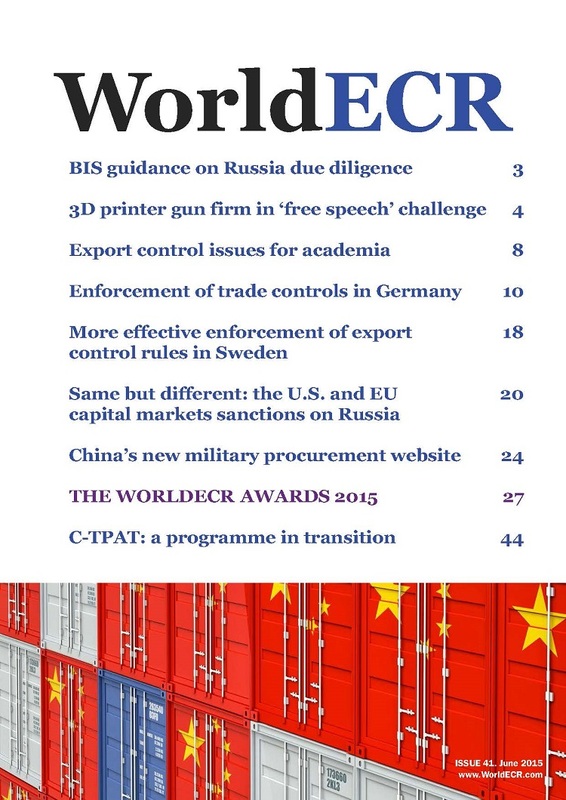 Each issue of worldecr includes reporting of key developments in export control regulation, enforcement and sanctions, and advice on compliance and best practice around the globe. 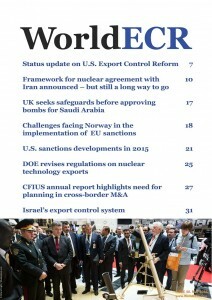 Back issues can be purchased below for £55 (US90). 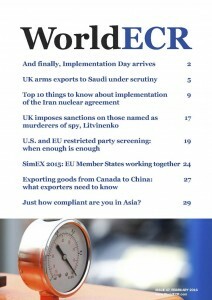 UK arms exports to Saudi under scrutiny * Top 10 things to know about implementation of the Iran nuclear agreement * U.S. and EU restricted party screening: when enough is enough * SimEX 2015: EU..
More non-U.S. banks hit with sanctions fines * The tricky business of de-risking * Canada: new dual-use General Export Permit * ‘Facilitation’: A new tool for extra-territorial sanctions.. 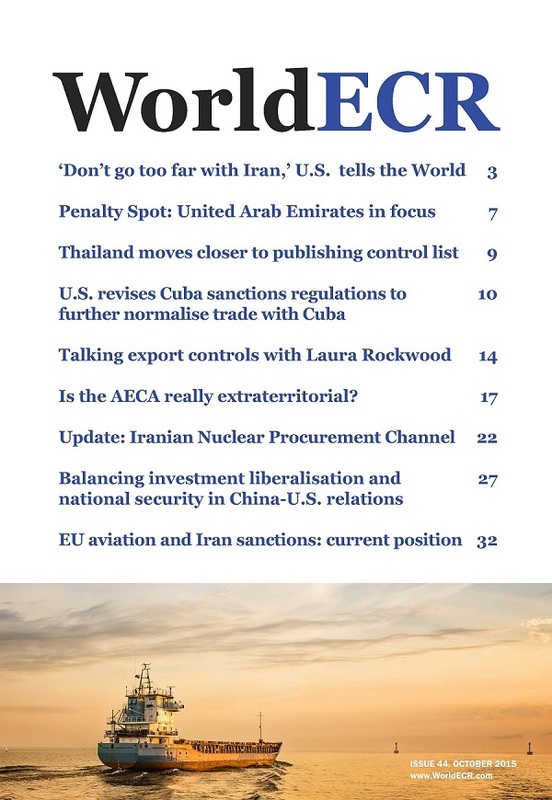 Balancing investment liberalisation and national security in China-U.S. relations * EU aviation and Iran sanctions: current position * Penalty Spot: United Arab Emirates in focus * U.S. revises Cuba..
Penalty Spot: Enforcement in India * Talking export controls: Marietje Schaake MEP * Why the Arms Trade Treaty matters * U.S. sanctions post a busy second quarter * The FATF and proliferation..
Top 10 things to know about the easing of sanctions under the Iran Nuclear Agreement * Myanmar, sanctions and investment update * Australia’s new U.S.-influenced export controls * Export controls.. Export control issues for academia * Enforcement of trade controls in Germany * More effective enforcement of export control rules in Sweden * Same but different: the U.S. and EU * capital markets..
U.S. sanctions developments in 2015 * DOE revises regulations on nuclear technology exports * CFIUS annual report highlights need for planning in cross-border M&A * Israel’s export control system *..
EO authorises sanctions against hackers * Caught in the 129 brokering trap * Sanctions biting business in Russia * Enforcement of export controls in the UK * South Korea’s system of export controls..
Cuba and the United States move closer; Sanctions in their sights: the UK bar gets busy; Between a rock and a hard place: the German anti-boycott law; Dual-use controls outreach: a new method; Recent..